Charlie Meyer spent Friday night at Miller Park. Not watching a game—the Brewers are on the West Coast—but coaching first base for the Wisconsin Timber Rattlers. Meyer is in his first season with the Brewers’ Class A affiliate and having the time of his life. Although still listed as a player/coach, Meyer knows his playing days are for the most part over. “It’s probably safe to say that I’ve hung up my spikes for good,” Meyer said. “I guess technically, I’m still on the roster, but the only way I’d play is in some kind of emergency, and that’s not something I want to happen. We carry three catchers on our roster already. Meyer ended last season as a player/coach in the Arizona League. He wasn’t sure where he’d land this season but hoped to stay within the Brewers organization. When he was offered the chance during Spring Training to move back to Wisconsin and coach with the Timber Rattlers in Grand Chute, he quickly accepted. Getting runners from first to third is an important part of Meyer’s duties during games as the first base coach, but he’s involved with many more aspects of the team’s day-to-day activities. “They’ve thrown more on my plate each and every year, and I’m totally OK with that,” Meyer said of his increased responsibilities. “There’s a fine line between being a player and being a mentor, but I really have enjoyed the coaching-aspect of things. 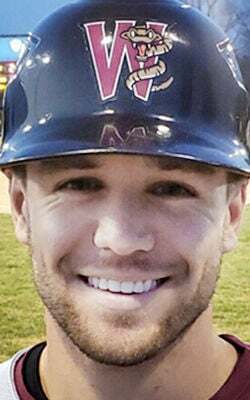 The 2011 Janesville Craig graduate isn’t sure of what his future holds, but he has a great appreciation for how the Brewers organization develops and caters to its players. “I know a lot of organizations are about looking toward the future and what’s best,” Meyer said. “The Brewers aren’t like that. They have the win right now attitude, and I like that. Marcus Hanel is currently the Milwaukee Brewers bullpen coach. He has been with the team for 20 years, but he’s 47 and can’t squat there forever. Meyer would love to fill that role if the opportunity ever presented itself. “That would be something,” Meyer said. “A dream job.